Disclosure- I received the below in order to facilitate my post. All opinions are my own and honest. I am disclosing this in accordance to FTC Guidelines. Please see “Disclose” tab for more information. Looking for a fun and easy dessert for Valentine’s Day? Entenmann’s is celebrating this year with the Entenmann’s Sweet Valentine’s Edible Bouquet and Entenmann’s Sweet Donut Sweepstakes. Fan of chocolate? Doughnuts? Sweets in general? Read on. Check out the Entenmann’s Facebook page to enter the Entenmann’s Sweet Donut Sweepstakes for the chance to win lots of prizes, including Entenmann’s coupons, Mr. Rich Frosted and Ms. Crumb plush toys, 1-800-Flowers arrangements and more. 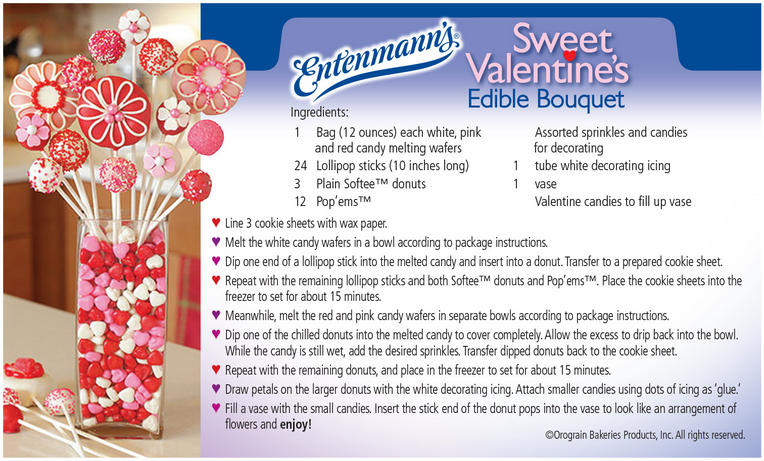 You can also make the Entenmann’s Sweet Valentine’s Edible Bouquet at home if you would like. Just use the below recipe card with simple step-by-step instructions and easy-to-find ingredients. Your kids will like making it- though not as much as they will like eating it. 🙂 It would also be an adorable gift for your child’s teacher. Want to make your own Sweet Valentine’s Edible Bouquet? My husband and kids 🙂 Thanks for the giveaway! I am excited. I hope I win the prize. I will share this awesome prize with my family, they are all my valentine’s this year! 🙂 I love Entenmanns sweets. Thanks for the chance! That is a great prize package I would give it to my gf if I win. i will give this to my dad because he loves entenmanns. This is adorable! I’d probably take it to work to share, or maybe give it to the kids who live next door. (Candy isn’t realy on my diet, and I’m trying so hard to be good!) Thanks for the great giveaway! I would give this to my daughter for Valentines. She is 16 and would love this. I would give this wonderful prize to my grandchildren~they would love it!! I’d give this to my mom! If I won I would attempt to do it with my grandkids but I doubt it will look like the one pictured but we will have fun. I would love this for myself! I am a huge fan of the entenmanns brand. I would give this to my husband. He loves sweets AND he would share it with me 🙂 Thanks for the giveaway! I am excited. I hope I win the prize. thanks for the giveaway i am excited,i hope i win. i would give this to my mum. I’d give this to a good friend of mine. I *LOVE* Entenmann’s glazed buttermilk donuts! What a fun prize. If I were to win I would share this with my family. We love Entenmann’s! I will keep it for myself. Thanks for the giveaway! I am excited. I hope I win the prize. I would have my children create some delicious & invite our neighbors to enjoy. My family. Thanks for the giveaway! I am excited. I hope I win the prize. Thanks for the giveaway! I am excited. I hope I win the prize. I’d Share With My Entire Family. I would give this to my mom. 🙂 Thanks for the giveaway! I am excited. I hope I win the prize. I would give this to myself! I love Entemann’s! Yum! Thanks for the giveaway! I am excited. I hope I win the prize. Thanks for the giveaway! I am excited. I hope I win the prize for my 2 grandsons. I’d give this to my boyfriend. 🙂 Thanks for the giveaway! I am excited. I hope I win the prize. I love entenmann’s products from donuts to cakes. Especially the chociolate covered donuts . My husband especially favors the cheese kuchens. My family would love to have an Entenmann’s party. I would invite my neighbor Dolly who favors the coffee cakes. Whats not to love? Keeping my coffee ready to brew when I might win these tasty treats! I’d share this with my kids! Valentine’s is a family holiday in our house! I would give this to my husband and we’d enjoy the goodies that we’d buy with the coupons together! Thanks for this giveaway. Would make it for my sweet husband. This is super cute & I would love to give this to my grandchildren. My grandchildren & I make something like this each year at Valentine’s Day. We use colored scrap paper to make hearts, place them on pipe cleaner stems and then into glass jars we have glued colored tissue paper too. It’s also very cute. I would love to give this to my sweet sister for Valentine’s Day. She would really have a blast with it! Thank you kindly! I would give this to my husband who would love to bring these treats into his office at work. I will give this to my son. “Thanks for the giveaway! I am excited. I hope I win the prize. I will give it to my girlfriend because she is the best ever. Thanks for the giveaway. it is super neato. I will give it to my boyfriend. Thanks for the giveaway! I am excited. I hope I win the prize. if i won i would give this to my dad,,,he gets so lonely around holidays like this since my mom passed away. I would give this to my kids and husband, and we would also share everything with my parents. This would be for the whole family. It isn’t really a question of who I am going to share it with, but will they share it with me. I would give this to my family. Thanks for the giveaway! I am excited. I hope I win the prize. That is just the CUTEST idea I have seen in a very long time! Love, love, love it!!! I would make this as a centerpiece for V-day breakfast. Thanks for the giveaway! I am excited. I hope I win the prize. I would give this to my GF. Thanks for the giveaway! I am excited. I hope I win the prize. I would love to give this prize to my boyfriend, he loves entenmanns products!! I will give this to my children! Thanks for the great giveaway! My 3 boys would love this! Thanks for a great giveaway! I would give it to DDs, they would love this! Thanks for sharing with us. I will give it to my daughter, shell love it! This would be for the whole family. We’re all big Entenmann’s fans; so much so that my kids got chocolate covered donuts in their stockings! My hubby loves their chocolate cake that comes in the square tin. I would love to give this prize to my family. Thank you for the giveaway! Thanks for the giveaway! I am excited. I hope I win the prize. What a wonderful prize package! I will share these items with my husband, daughter, and grandsons! Thanks for the giveaway! I am excited. I hope I win the prize. I would give this to my husband. Thank you. I would give it to my husband. Thanks for the giveaway! I am excited. I hope I win the prize. “Thanks for the giveaway! I am excited. I hope I win the prize. ” i would give it to my hubby,he’s my sweet valentine because he helps me out so much. No date this year, but I think the holiday is about showing anyone you love how much you care. So I would give this to my mom. I got my sweet tooth from her, so I know she would love it! Thanks for the giveaway! I am excited. I hope I win the prize. “I will keep this for myself as I do not have a Valentine this year. I don’t have a Valentine this year 🙁 but I would give this to my mother b/c she deserves to have a good Valentines Day.